We supply a wide range of sugar and sweeteners for business and trade sugar suppliers providing everything from sugar bags, sugar cubes and crystals, to sugar sticks and sugar sachets in a range of sizes and varieties ranging from regular white granulated sugar to fair trade Demerara sugar and everything in between. 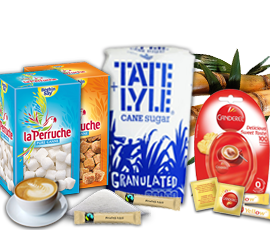 Great deals on popular brands including Tate Lyle, Canderel, and La Perruche. We carry a large stock of sugar supplies ready to buy for next day delivery to your business.